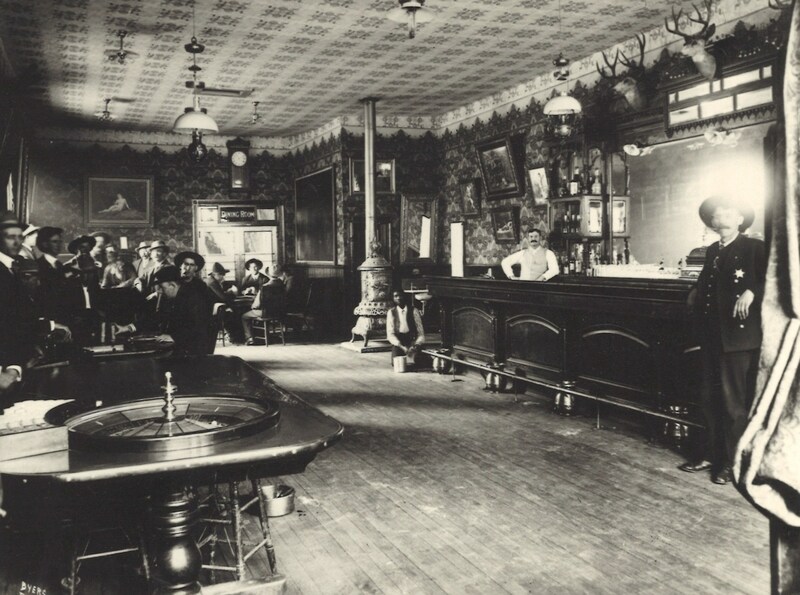 Telluride’s Cosmopolitan Saloon; Kenny McLean appears at right. In the first year of Kenny and Alice McLean’s daughter’s life, labor strife at the Telluride mines was affecting the community. On 1 September 1903, difficult and scary times came to Telluride. Union members demanding an eight-hour rather than a twelve-hour workday walked out of Telluride’s ore processing mills. This shutdown caused the closing of area gold and silver mines. When the Tomboy gold mine tried to reopen with nonunion workers (strikebreakers or “scabs”), the union posted armed picketers to prevent the new workers from entering. At the request of mine owners, Colorado National Guard troops were called in to help keep the peace. In a letter to Kenny’s sister Christine on 3 January 1904, Alice laments that it didn’t seem at all like Christmas to her because of the strikes, saying “all the miners working here now are from the outside. . . The soldier boys have been here for a month or two . . . and nobody can go to the mines without a pass.” Local deputies took to arresting striking miners for vagrancy. Once the mines were successfully operating with imported nonunion labor, the troops left Telluride in January 1904. It seems the bad feelings over the labor wars did not die quickly. 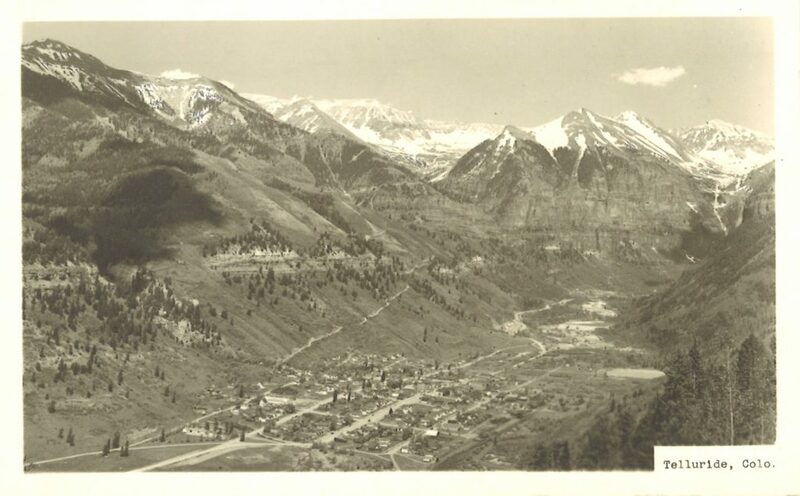 A year later, in early December 1904, the Telluride Journal reported on Kenny taking care of business in wild-west style: “Among the returning exiles is John Conn [one of the men arrested during the strikes], a Finnlander prominent in the palmy days as proprietor of a blind pig whiskey joint in the basin, an alleged fence for ore thieves, and busy agitator. In late December, the paper was able to report on a happy event, the birth of Marshal McLean’s son, my Great-Uncle Fred: “Mrs. Kenny McLean presented her liege lord with a Christmas gift at 8:30 this morning, in the shape of a little son. 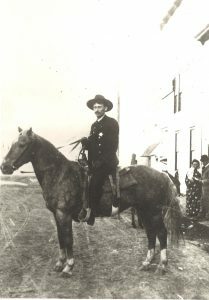 Dr. J. Q. Allen, master of ceremonies, says the youngster is a fine specimen and all are doing nicely.” A few months later, there was more good news: on 4 April 1905 Kenny was elected City Marshal, which meant no more night duty – something that Alice believed was the cause of the stomach problems he’d been having over the last year or two. Colorado Labor Wars, Telluride strike, September 1903; Carrol D. Wright, “A Report on Labor Disturbances in the State of Colorado,” Senate Document No. 122, 58th Congress, 3rd Session, 1905. “Great-uncle”? Or is he a granduncle? Sharon’s grandmother’s brother is her great-uncle. Grand-uncle is sometimes used, but it becomes awkward when considering great-great-uncles and -aunts. This is an area that needs addressing on several fronts, one of which is consistency: First, how do we spell granduncle and grandaunt, with a hyphen? If so we then need to spell “grand-father” and “grand-mother” as such which we don’t. Second, if we improperly call a sibling of a grandparent a “great aunt or uncle” it implies a missing generation. I’ve personally been thru this, looking for the missing generation that didn’t exist. In the 1600’s kinship terms were loosely used, creating conumdrums as to relationship. In the 21st century we ought to be doing better, and realize and publish as such that a great uncle is a sibling of a great grandparent, not of a grandparent. Thanks for the story – very interesting. Those were rough and tumble times! I visited with my husband and kids about 10 years ago. It is a very different place now. Trendy shops and skiing and film festivals. 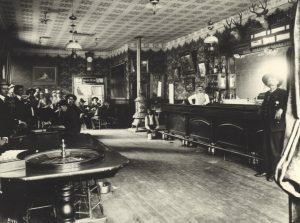 What was the Cosmopolitan Saloon is now an art gallery.